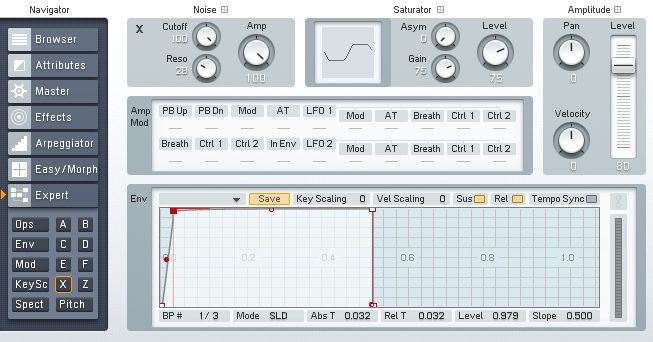 A great feature of any synthesizer is its ability to create and use noise. Today we will explore the noise generator in FM8. Noise is one of the key features in making dance music, creating great transitions and powerful drops. Today we will explore how to use FM8’s noise generator to do both of these things. Load up a new patch. Operator X is a noise generator. Turn Operator F off and Operator X on by right-clicking in the FM matrix. Route operator X to the output at a level of 80. Go to the noise generator window (‘X’ underneath Expert). Turn up the noise amplitude (‘Amp’) to 100. Adjust resonance to taste – I recommend a setting in between 25-50. Leave the default settings for the other parameters. I also prefer a slightly slower attack with noise, which you can adjust in the Envelope display in the noise generator window. Drag the attack slightly to the right to achieve this. We then will map a MIDI controller knob (or your modulation wheel) to the cutoff of X. Click MIDI learn (in the top right of FM8 on the application control bar), click ‘cutoff,’ and move the controller knob. You’ll hear the noise colour change as you do this. A final tweak – I like to use a touch of reverb to make the noise fit better in the track, along with a shelving EQ to boost the highs and cut some lows. The lows and mids are where most problems arise with a mix. Overdrive also sounds nice, with a complete removal of the bass frequencies and boosting the tone/drive to 100. Go to the Effects section to do this. This setting is great to use as a ramp up to transitions, automating the cutoff from 50-100. Don’t start the cutoff below 50 as the frequencies become too low and inaudible. 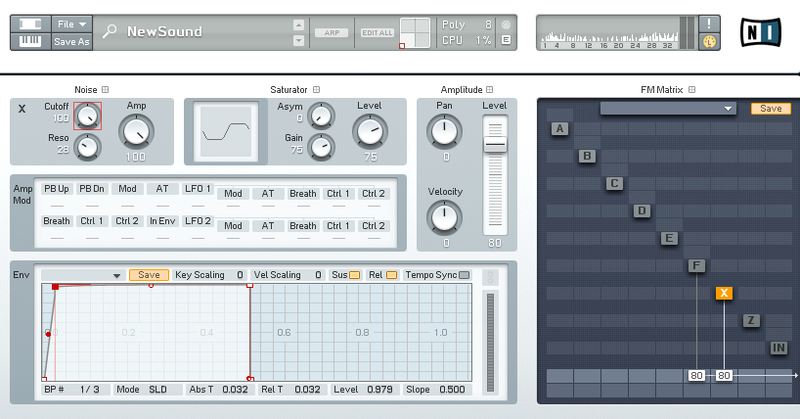 You can use the LFO to “side-chain” the noise to the kick, which can be done in the ‘Mod’ section. Invert LFO 1, click the ‘sync’ button, and set the ‘Delay,’ ‘Key Scale,’ and ‘Vel Scale’ to 0. I found that between 30-35 the sync was the right setting for this purpose, assuming there is a kick on each downbeat. 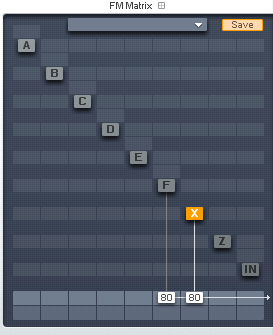 Route LFO1 to modulate the noise generator X. I like the sound of a soft square LFO for side-chaining purposes. Side-chained white noise is great for making your drops more powerful. This use of FM8’s noise sounds best when the noise cutoff is set to 100. For those unfamiliar with “side-chaining,” it is a way of manipulating the sound of one track with the sound from another. 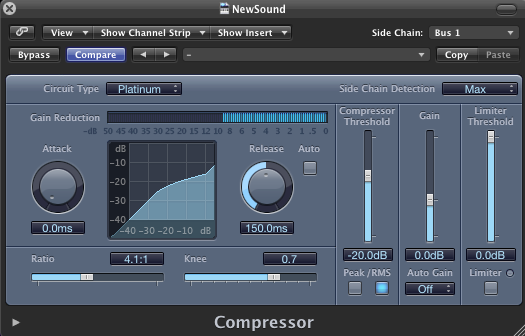 In dance music this normally happens with a compressor “side-chaining” parts underneath the kick drum. Whenever the kick drum plays, the “side-chained” part will compress at whatever ratio and attack/release settings the compressor is set at. For side-chaining white noise, I recommend an attack of 0 and release between 140-160 milliseconds. Notice how the side chain input is bus 1 (top right), which is where I am sending my kick drum. So, now you have it. 2 useful ways to use the noise section in FM8 for dance music. Now get cracking!